It has been all of about one day since the Recovery Accountability and Transparency Board — yes, the RAT Board — and Smartronix, the company that was just awarded a $9.5 million deal to (re)build Recovery.gov are catching a lot of heat… for lack of transparency, of all things. The Web world has been atwitter with discussion about this — there is even an online petition started by Jim Gilliam, who created WhiteHouse2.org, NationalBuilder.com, and act.ly. 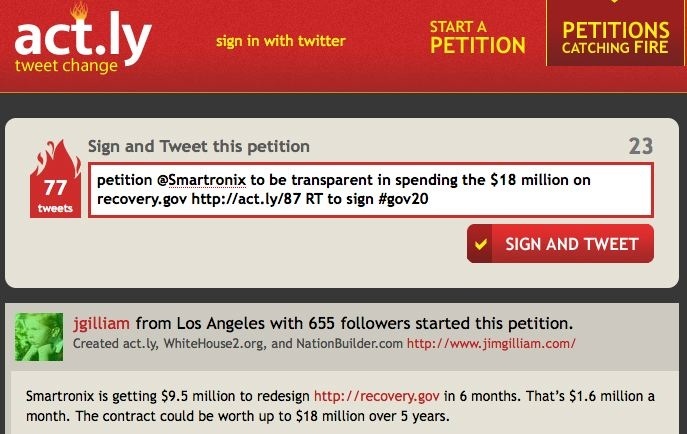 Smartronix is getting $9.5 million to redesign http://recovery.gov in 6 months. That’s $1.6 million a month. The contract could be worth up to $18 million over 5 years… We expect Smartronix to be transparent in how they spend money, and are calling on them to unprotect their twitter updates, and tweet regularly on where the money is going and the progress of the project. Recovery.gov is all about transparency in spending the stimulus funds, so it’s only reasonable that the contractor building the site make that process transparent too. On the face of it, $9.5 million seems like a lot of money to build a Web site. My sense is that this is exceedingly complex — and I keep saying over and over again, the recovery project is extremely unique — in its scope, in its size, in its speed, and in the level of transparency that the Obama administration is trying to bring to the project. Nothing like this has ever been done before — and it all needs to be done yesterday. So there is a lot of pressure coming from multiple saides. While the Internet seems to be in virtual meltdown over the price tag — the contract could be worth more than $18 million if all of the options are exercised — there is some valuable discussion going on — and there are some steps that the Recovery Board can — and should — take. Second — It is the Recovery Board’s job to talk about the contract, not the contractor, Smartronix. To be honest, I haven’t seen the contract nor the request for proposals, but my guess is communicating about it was not included in the specifications. And, frankly, it was the Recovery Board’s decision to use the GSA Alliant contract for this bid and to hire Smartronix. It is their project. Third — We need to give the Recovery Board and Smarttronix some time to get all their pieces in line. This contract was just awarded. In the end, the two sides need to talk and get a game plan together so they don’t fill the information vacuum with bad information — bad information that, and let’s be honest here, we will only bludgon them with later. I know it sounds contradictory to tell the Recovery Board to speak, and yet to take their time, but… we all know how important it is to communicate. The Recovery Board has a very difficult task — and it is important that they succeed. As you can tell, there are people who want to help. Tap into them — and the board can do that by just keeping them informed… and asking for help. Target all this energy in a more positive direction. There are some other reasoned responses out there. I don’t think [the price tag is] the real problem here. The real problem is transparency. The real problem is that while many are outraged at the cost, you can’t presume that the government isn’t spending its money wisely unless you know both what Government is paying and what they’re paying for. We don’t know what they’re paying for, yet. The $9.5M is expensive, not unreasonable. – It’s expensive to do business with government. – Doing things on a rush adds a premium. – People will be working round the clock, so expect overtime. – Govt + Rush = Quadruple costs. – Design, build, test, and a launch a website in less than 3 months (Oct 10 is the key date). And don’t forget running lots of stuff by the lawyers. – It’s a fixed-price bid so contractor over-estimates. – Run at least a couple of teams on sub-projects to minimize risk. – Recovery Board needs to coordinate information flowing in from 26 agencies, 50, states, hundreds of municipalities, and potentially tens of thousands of sub-contractors. Huge coordination overhead costs in this project. – It is the first web site attached to an appropriations bill. – It is a front-end glued onto a back-end still-being defined and of a breadth and depth of reporting that rivals the largest of government reporting projects. – It is a website that must present data that has not yet been created. – It needs/should be 508 compliant. – The executive management on the Recovery Board are Inspector Generals (aka, ex-law enforcement and lawyers). Oh, and just for reference, Twitter raised at least $20M from 2006 – 2008, a shorter period than the $18M being spent for 2009 – 2014 time frame of this project. And, like, how many features does twitter have? On Federal News Radio 1500 AM’s Daily Debrief with Chris Dorobek and Amy Morris Thursday, we spoke with Federal News Radio’s Jason Miller about the award. And we mentioned that there is a lot of risk here. And, frankly, there is little reward if Smartronix goes above and beyond. In fact, it is a fixed price, so there is no reward. On that note, I wonder when Federal IT contractors will resource tech community participation? It might give some bids an advantage. And related, what are the larger Federal IT contracts that have promised open source efficiencies/benefits? For example, if I had been involved in a Recovery.gov bid I would have thrown in use of the site or software by states since that appears to be the big hole in tracking the details of stimulus spending. Meanwhile, it’s important to remember that the goal is stimulus — and to provide transparency and accountability into that stimulus package. It’s interesting because the Republican National Committee already has an ad out that references the $18 million contract. As always, I don’t care about the politics of it. The goal is to help the government work better, so… I’ll continue working to get the Recovery Board on the air to answer some of these questions. Finally, I wonder if this issue might spur greater transparency in the task order process. TechPresident refered to the bidding for the Recovery.gov contract a “closed bidding.” That seems unfair. And that seems overly conspiritorial. They used an established process. That being said, that process needs to be changed. There is all sorts of buisness that goes through multiple award contracts — so called MACs — including this one. These multiple award contracts include everything from the GSA schedule contracts to governmentwide acquisition contracts such as GSA’s Alliant, which the Recovery Board used for this procurement. There are all sorts of reasons one would use those contracts — one is speed. But it wasn’t “closed.” There are 59 companies on Alliant alone. That being said, there isn’t much transparency in these multiple award contracts. In the end, vendors who win these contracts only “win” a hunting license. They then have to compete for task orders under those contracts — and there is almost no transparency in that process. The task orders are generally not posted publicly. And often, you don’t even hear about the awards. If somebody wanted to be angry about something, that seems like a good place to start.